The police chief in Mesa, Arizona, who has said he was disturbed by video in two other incidents, says the latest video doesn't tell the whole story. The attorney for a man arrested by Mesa, Arizona, police in January has released video footage appearing to show one officer punching that man and then another officer mocking the bleeding man after he is taken to a hospital. It's the third video to surface in recent weeks raising questions about the use of force by police officers in the Phoenix suburb. Jose Luis Conde, 23, was arrested on Jan. 28 after the car he was riding in was pulled over. Police said in an arrest report that during a search that detected suspected drugs in his sock, Conde "tensed" and turned to face the officer. The officer says in the report that he believed that an attack was about to occur, so he grabbed Conde and "took him to the ground," the report said. Police said he resisted arrest. "I was tased, I was punched over and over by multiple cops. I was gouged in the eye. And I was hit in the head with a massive police flashlight," Conde said at a news conference with his attorney in Phoenix on Thursday. "After all of this, they laughed — they laughed at me while I laid in a pool of my own blood, barely conscious. And this is no laughing matter," Conde said. He and his attorney said part of his ear had to be sewn back on and he required staples in his head after the arrest. Police video that Conde’s attorney, Bret Royle, said he obtained through the court process appears to at one point show an officer punching Conde and swearing at him while Conde is on the ground. At another point in the video, in a hospital room, an officer says "aww" to the bloodied Conde and tells him, "You gotta be a man, man. Man up." Mesa Police Chief Ramon Batista has vowed an independent investigation by a national policing group into use-of-force incidents after two other arrests in May in which a 35-year-old unarmed man was beaten by officers and a 15-year-old armed robbery suspect appeared to be roughly treated by officers. Seven officers have been placed on leave in those two incidents. But in this case, Batista said of the new video, parts of which aired on NBC affiliate KPNX of Phoenix Wednesday evening: "Simply put, the tape released yesterday by media outlets does not tell the full story concerning this arrest." 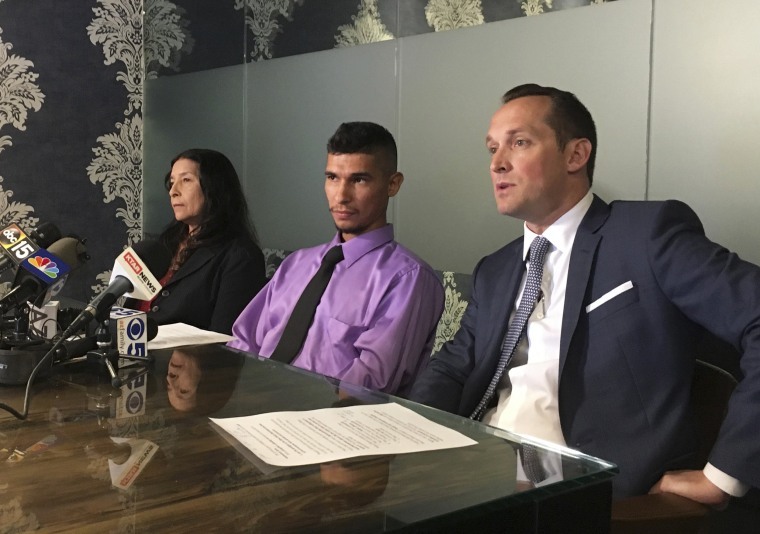 Royle said he released the video after initially inquiring to AZCentral.com, which is affiliated with The Arizona Republic newspaper, about the May cases to see if there was any overlap with Conde's arrest. The arrest report says police discovered bags of cocaine in Conde's sock. It says he was combative with officers during the arrest, and tried to run out of his hospital room. Conde is charged with felony possession of cocaine, aggravated assault for injuries to the officers, and one count each of escape and resisting arrest, according to court documents and Royle. "In recent weeks, the Mesa Police Department and our community have experienced some significant challenges," Batista said. "Please be assured that we will get through this difficult period together and emerge even stronger." Also Thursday, a judge dismissed charges against Robert Johnson, the unarmed man shown in surveillance video being repeatedly punched by police, at prosecutors' request. He had been charged with disorderly conduct and hindering prosecution. Johnson's attorney, Benjamin Taylor, said he was pleased that the charges were dropped. "It shows that justice can be served," Taylor said in a phone interview Thursday. "Mr. Johnson was the victim in this case." Police said in a report that they ordered Conde to get out of the car partly because of a previous firearm and drug violations. Royle disputed that and said Conde has never been charged with weapons counts, but is on probation for an aggravated DUI case. Online Arizona court records do not appear to show a past weapons charge. Royle said the police video he received through the court process does not show Conde making any attempt to run from the hospital room. He wants the charges against his client dropped. CORRECTION (June 15, 2018, 5:48 p.m. ET): An earlier version of this article misstated Robert Johnson's age. He is 35, not 33. It also gave an outdated reference to KPNX's relationship with AZCentral.com. Their affiliation ended in 2015.